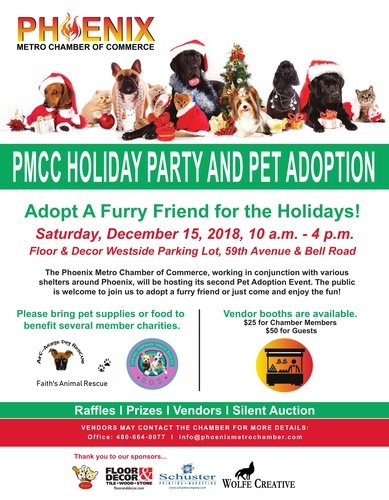 Come out and show your support at the Phoenix Metro Chamber of Commerce Holiday Party & Pet Adoption! Santa will be making a special appearance, too! HOHOHO! The Phoenix Metro Chamber of Commerce, working in conjunction with various shelters around Phoenix, will be hosting its second Pet Adoption Event. The public is welcome to join us at this FREE EVENT to adopt a furry friend or just come and enjoy the fun! No registration to attend is necessary! Please bring pet supplies or food to benefit several member charities.